Application deadline: Monday, 6th of April 2019. ACT Independent Theater Festival Sofia and the Berlin Performing Arts are coming closer together! With Bridging the Scenes the festivals offer a special exchange opportunity for interested members of the independent performing arts communities in Sofia and Berlin. The program provides space for encounter, common experiments and visions! ACT Independent Theater Festival is presenting recent productions from the local performing arts scene and invited shows by international guests alike. Each year in the fall, the festival is carried out in several venues across the city by the ACT association for independent theater. 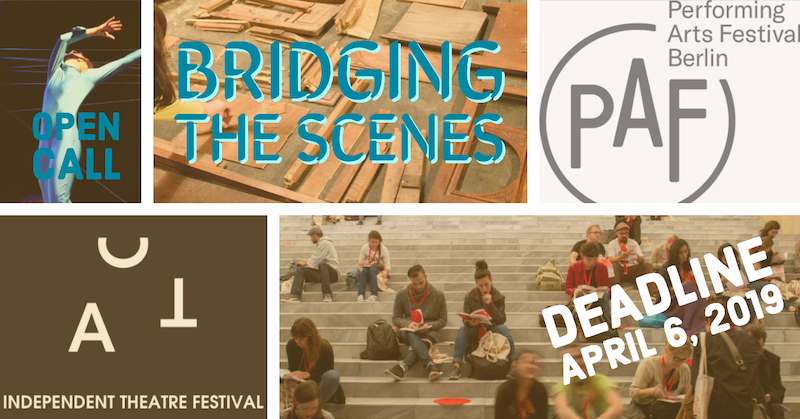 Bridging the Scenes presents six artists and/or production managers from Sofia and Berlin with the opportunity to participate in both festivals. On the introductory day (the first day of both festivals) with workshops and presentations, the participants get to know each-other as well as the respective local scene. During the entire time of the festival, the participants discover the aesthetics and working methods in each country. They attend the discussion events in the schedule of programming for visiting industry professionals and benefit from the diverse networking opportunities provided by the Festivals, entering into exchange with Berlin’s and Sofia’s independent performing arts community. A local expert will guide them through the experience and support their exchange and networking. The group will have daily informal morning meetings with the local Guide. The ambition of Bridging the Scene is to establish long-lasting collaboration between the participants, their professional inclusion in the European independent scene and to develop possibilities for coproductions, common projects and performance exchange between Berlin and Sofia. After the pilot version in 2018, Bridging the Scenes has evolved to offer a special exchange opportunity. It aims to further establish the connection between the independent performing arts fields in Berlin and Sofia.